Once upon a time (otherwise known as two weeks ago), we were having a houseful of company for the weekend. I had the meals planned, and worked to get as much cooking done ahead of time as possible so that I could enjoy my guests once they arrived. Fast-forward to the part where I was standing at the store in the aisle of broth. I saw the tiny little box of broth along with its price tag. Out loud to the shelf, the broth, the price tag, and likely to a few other shoppers passing by, I said, “Ugh. $2 – for this? ?” I cringed as I put three boxes in my cart. I cringed even more when I poured the watery broth into my soup pot. When I make broth, it’s thick and rich, full of vegetables, fat, and gel from the bones. For the price of three boxes of store-bought (watery) broth, I can make 2 gallons of homemade, nourishing broth. I pack it full of veggies. I cook it slow and low until the good fat and nutrients seep out of the bones. You haven’t had broth until you’ve had homemade bone broth. This is incredibly delicious, and so very good for you! Even better, beef bones are very inexpensive to purchase. I purchase beef bones from a local farmer who raises grass-fed beef. You can also check butcher shops and your grocery store meat department to see about getting a good deal on beef bones. I personally love how easy beef bone broth is to make. In addition, I often make Chicken Broth, which is also incredibly nourishing and rich. But it does take a little more effort if you are starting with whole chickens. Making broth from beef bones requires very little effort – and very little money – just to restate one of our main points today! So, three cheers for homemade bone broth! It’s one of the most inexpensive ways to get loads of nourishment into your family. In case you lost count, that’s 12 amazing ways to fill yourself and your family with nourishment in a very inexpensive way. 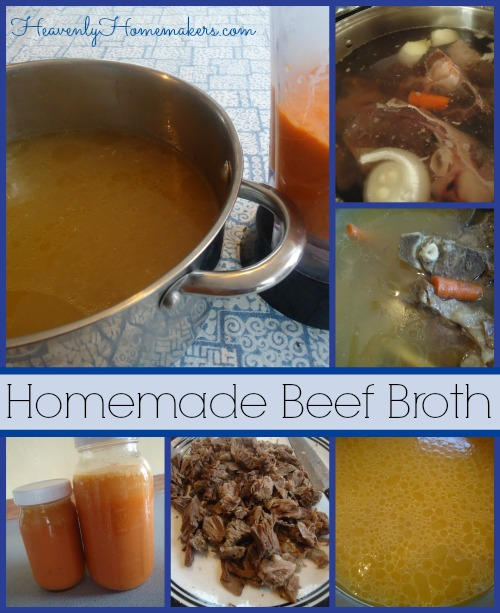 Homemade Beef and Chicken broth are amazing! What are your favorite ways to make and use beef or chicken broth? I mostly use stocks in soup – but I like to freeze vegetable trimmings (like the leafs of carrots and celery, ends of tomatoes, stalks from greens) and make vegetable broth from those when I get a full bag. 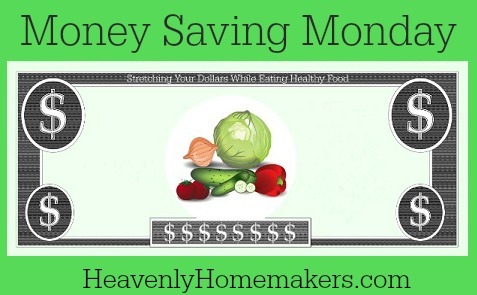 It is a great money saver and vegetable broth is also nutritious and delicious! 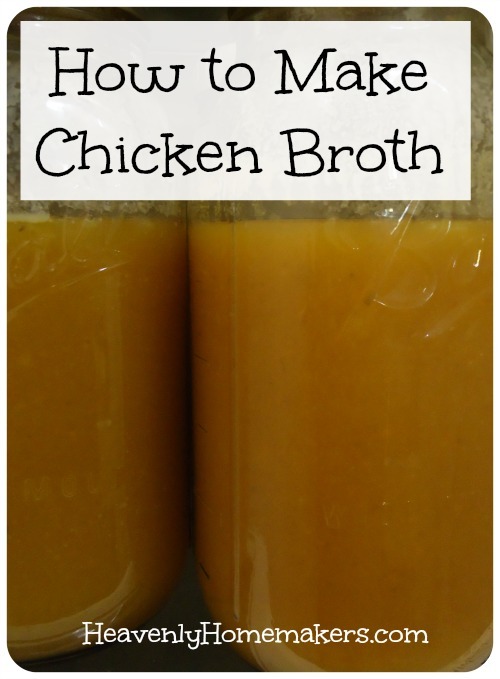 I agree that homemade bone broth is the best! I just made about 3 gallons of turkey bone broth from the carcass my sister gave me last Thanksgiving. It was nearing a year in the freezer, so I figured I’d better get to it. I always ask for the bones, usually called dog bones but I use them to make broth, when we purchase 1/4 grass fed beef every year. They have really built up in my freezer and though I already have beef broth in the freezer, I need to make more. You can never have too much homemade broth! I have been making my own chicken broth for years and always end up with more than I have room to store in my freezer. I now make homemade boullion cubes out of it. It is really simple – boil the broth until it reduces down to a thin syrup-like consistency (coats the back of a spoon), then spread it out on a parchment paper or plastic lined pan, chill and cut into cubes. One gallon of broth makes about 1 cup. I freeze the cubes on a cookie sheet, then put them all in a Ziploc bag (makes it easy to just take out what I want). I never start with a whole chicken. Our local Costco has a great deal on rotisserie chicken, and I strip all the meat off, and then use the bones. (My adult kids save their carcasses for me, also.) I keep a bag in the freezer of carrot, onion and celery scraps – ends, skins, peelings, leaves – and use those along with some garlic to kick the flavor up. To add even more flavor, roast the bones in the oven until they are golden brown before making the broth. I get great satisfaction in knowing that my broth costs me nothing – I use only what would normally be thrown away. Oops, except the garlic – that is probably worth a few pennies. I’m getting ready to try something similar to this idea. After boiling down the broth to thicken it, I’m going to spread it on my dehydrator trays, like fruit leather. After drying, I’m going to break it up and grind it into a powder, then dehydrate further if necessary. It will be shelf stable this way, and I’ve read that 1 tsp. of the powder will make 1 cup of broth. I’m excited for the possibilities of homemade seasoning mixes, using homemade bone broth powder instead of beef bouillon. Beef stew seasoning mix, brown gravy mix, the possibilities are endless! This is exactly what my youngest son suggested that I do! Please be sure and post about it – I will be watching for it. Have You Ever Used Deer Bones To Make Broth? This is one of my favorite ways to save money. I make my broth in the crock pot on low overnight. In the morning, I remove the lid, let it cool, and then freeze in freezer bags. I don’t have trouble with them leaking in the freezer, but I often have a mess when I defrost them in the fridge. To prevent that, I place the bag in a bowl and let it defrost that way. Thanks for the post and all of the wonderful recipes, Laura. It is incredible how weak store bought broth is when you are used to homemade. I too LOVE saving money by making my own broth. I make up a huge batch and freeze in ice cube trays. When frozen I pop the cubes into a ziplock bag and store in the freezer. When I need broth, I grab a few cube (I know how many make 1 cup etc) and thaw. So easy, delicious and saves us tons of money. I make a lot of homemade soups in the winter, and love that I always have homemade broth on hand in the freezer! My 3 little boys love when I make beef broth and get out their little tea cups and guzzle cup after cup of it! They would love drinking it every night before bed if I did not think it a pain to heat a little from frozen, but they love broth day! Kudos to another commenter, Missy! I too started making my own broth because of Laura’s posts! I made a batch yesterday & today – an all-nighter in the crock pot. With the first batch of broth, I made chicken noodle soup for a neighbor who is having surgery tomorrow. Now I’m making the ‘second batch’ with fresh veggies to have on hand for future soups, stews, rice, etc. When the second batch is done, I grind the skin & bones and feed it to the dogs. I make beef broth too, thanks to Laura! We buy our beef a 1/2 cow at a time and I always have plenty of bones for delicious rich broth. Laura, I absolutely agree that homemade broth is FABULOUS and it is an easy, inexpensive way to be a blessing to others. I always try to keep at least one gallon ziploc bag of chicken broth in the freezer to pull out a moment’s notice and make into a homemade chicken noodle/tortilla soup for a friend who is sick or a widow who is grieving or for a busy mom who needs help. It is so easy to make, takes little time, and is incredibly healthy. So many ways you can use it for your family and for others. Thanks for reminding us of the little ways we can use what we already have on hand to stretch a little further!